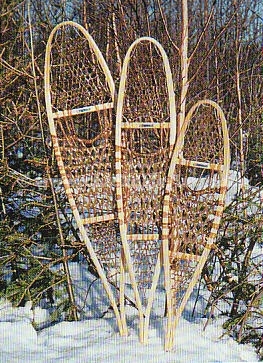 Please note that these snowshoes are functional ones made by a Native American-owned and operated company in a production environment for actual use by enthusiasts. 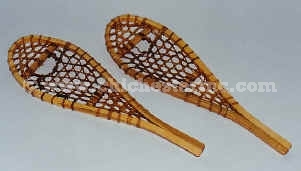 If you are looking for finely finished, hand-crafted snowshoes made by an artisan using moose sinew with fine webbing and a lot of detail work, these may not be for you. We sometimes have a selection of used snowshoes that will meet this requirement, but these can cost between US$300 and US$500 each. If you want to hit the trails with real wooden snowshoes, then these are perfect. The weight recommendations below are a guideline for use in deep, fluffy snow. For damp or compact snow, the snowshoes will work well with up to a 50-pound higher load. The shoe capable of carrying the heaviest load is the 16" by 32" Bear Paw described below. The biggest snowshoe we can get is a Wide Trail one made from aluminum. It is 12" by 42" and will carry loads up to 300 pounds in deep, fluffy snow and 350 in damp, compact snow. The order code is R-47-5049 and the price is US$425.00. You will need bindings as well. Click here for MORE Snowshoes. 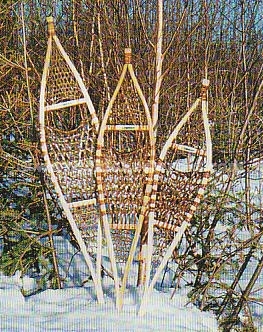 The Huron Mini Snowshoes are made just like larger, working snowshoes, and are a great decorative item. These 16" snowshoes do not come with a harness, and are made with real rawhide lacing. Weight of each pair: 8 oz. 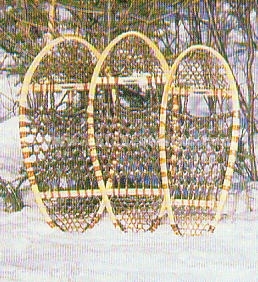 Huron Snowshoes are used for walking on trails or in open woodland. They are recommended for family recreation. Split lacing. Bindings sold separately. See below. Bear Paw Snowshoes are ideal in dense woods or in situations where it is necessary to turn often. Split lacing. Bindings sold separately. See below. Modified Bear Paw Snowshoes are the most popular snowshoes for any type of environment. Split lacing. Bindings sold separately. See below. Alaskan Snowshoes work well on open ground and in deep snow. Slightly turned up front ends allow sliding on hard surfaces. Full grain lacing. Bindings sold separately. See below. 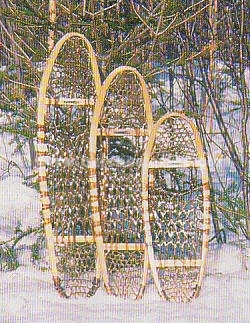 Ojibwa Snowshoes work well on open ground and in deep snow. Also called the “ski-snowshoe” because slightly turned up front ends allow sliding on hard surfaces. These are made with full grain leather lacing instead of split. Bindings sold separately. See below. The lacing must be varnished regularly to keep the hide from sagging. Our supplier uses boat varnish which can be purchased at most hardware stores. If the lace becomes limp after use, it must be dried slowly (away from a direct heat source), and then generously varnished with an exterior oil-based varnish. Do not allow wet lacing to freeze by leaving in the trunk of a car, for example. Snowshoes should be stored in a cool, dry place away from the sun and rodents, which may be fond of rawhide. 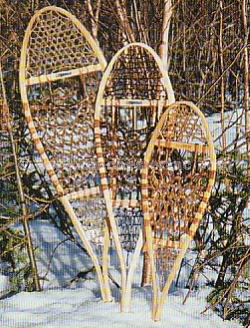 A tail on a snowshoe (as in the case of the Huron, Alaskan, and Ojibwa models) acts like a rudder and allows the snowshoe to stay in a straight line with each step. It also serves as a counterbalance weight at the back of the snowshoe, thus helping to lift the tip out of the snow. However, in dense forest especially in deep snow, the tail can be cumbersome in turning around trees that are tightly spaced. For this type of snowshoeing, a bear paw style is recommended. The bear paw snowshoes provide greater manageability and are easily stored and transported, but the round heel will make the snowshoe drag with each step. Despite this, the bear paw snowshoe is still the first choice of forest workers, trappers, hunters, and winter campers. 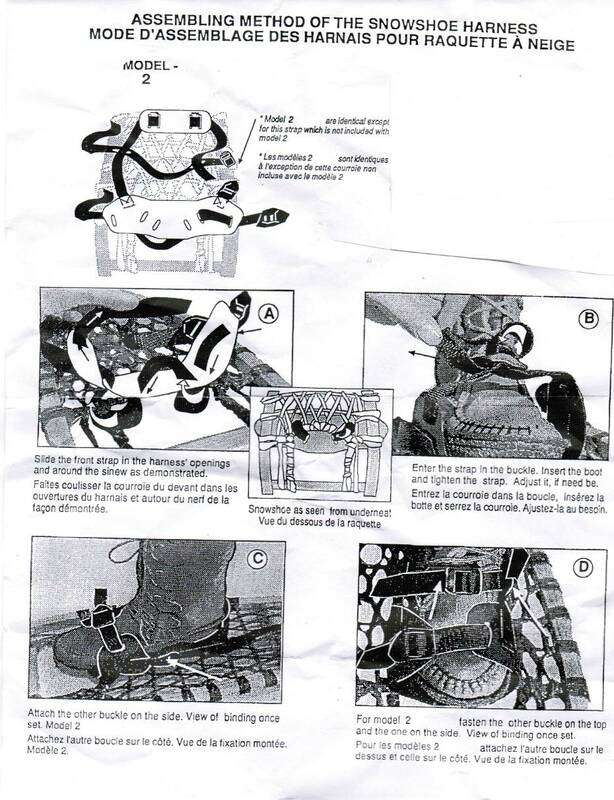 In general, the heavier the individual, the larger the surface area needed to support his/her weight in the snow, and the taller the snowshoer is, the wider the snowshoe he or she can choose. A shorter person with snowshoes that are too wide will have to lift his or her knees up higher with each step.